[160 Pages Report] The wireless POS terminal market was valued at USD 5.74 Billion in 2016 and is expected to be worth USD 13.00 Billion by 2023, at a CAGR of 11.59% during the forecast period. The base year considered for the study is 2016, and the forecast period is 2017–2023. The research methodology used to estimate and forecast the wireless POS terminal market begins with obtaining data on key vendor revenues and sales volume. A few organizations associated with the market include IEEE Standards Association and Kiosk Association, among others. The vendor offerings have been taken into consideration to determine the market segmentation. The top-down procedure has been employed to arrive at the overall size of the market, which includes type-wise revenue generated by the companies through the sale of wireless POS terminal systems worldwide. 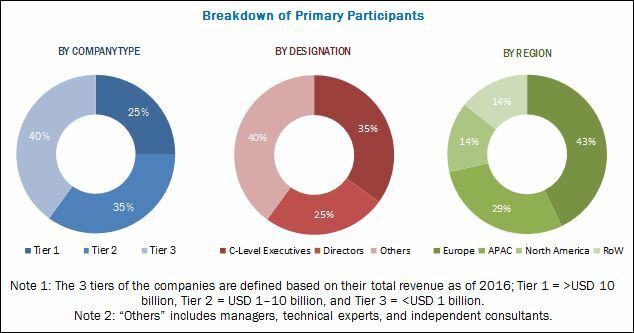 After arriving at the overall market size, the total market has been split into several segments and subsegments, which have then been verified through primary research by conducting extensive interviews with key experts such as CEOs, VPs, directors, and executives. The data triangulation and market breakdown procedures have been employed to complete the overall market engineering process and arrive at the exact statistics for all segments and subsegments. The wireless POS terminal ecosystem comprises many entities, from component manufacturers to technology providers, which include Ingenico (France), Verifone (US), First Data (US), PAX Global Technology (Hong Kong), NCR Corporation (US), Diebold Nixdorf (US), BBPOS (Hong Kong), Elavon (US), Castles Technology (Taiwan), Winpos (Finland), BITEL (Korea), Cegid Group (France), Squirrel Systems (Canada), Newland Payment Technology (China), and CITIXSYS AMERICAS (US). In this research report, the wireless POS terminal market has been segmented on the basis of component, type, industry, and geography. 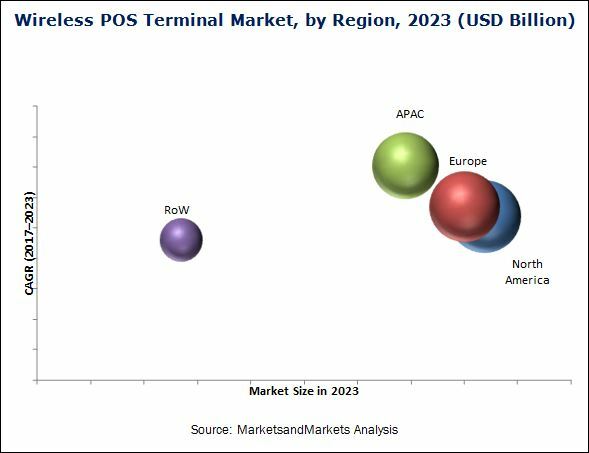 The wireless POS terminal market was valued at USD 6.73 Billion in 2017 and is expected to be worth USD 13.00 Billion 2023, at a CAGR of 11.59% during the forecast period. The factors such as wide adoption of wireless payment terminal by retailers; growing use of EuroPay, MasterCard, and Visa (EMV) cards; increasing e-commerce transactions; increase in cashless transactions in different countries; and growing adoption of wireless technology in mobile handsets and wearables drive the demand for wireless POS terminals. The report covers the analysis and forecast of the market based on component, type, industry, and geography. The study identifies and analyzes the market dynamics such as drivers, restraints, opportunities, and challenges for the wireless POS terminal market. It also profiles the key players operating in the market. The wireless POS terminal market based on type is segmented into portable countertop and PIN pad, mPOS, smart POS, and others. The portable countertop and PIN pad segment held the largest share of the market in 2016. Portable countertop POS solutions are compact, easy to install, and simple for both merchants as well as customers. These are used in small businesses with in-store purchases, in both stationary and semi-mobile forms. These solutions are largely deployed in several industries, such as hospitality, sports and entertainment, and retail. Apart from accepting payments, these devices can also support rich multimedia to drive customer engagement and build loyalty. The wireless POS terminal market based on industry has been segmented into retail, hospitality, healthcare, transportation, sports and entertainment, and other industries. The demand for wireless POS terminals for the retail applications is increasing as the deployment of these systems prevents transaction frauds and executes secure online payments. In addition, advanced features such as efficient invoice systems, discount offers, inventory management systems, data back-up, and customer record maintenance make POS terminals more attractive to retailers willing to streamline their businesses. North America is expected to hold the largest size of the wireless POS terminal market during the forecast period owing to the growing modernization of the payment industry, along with a focus on offering customized or business-specific solutions. This region holds the largest market size due to the significant use of wireless POS terminals across several industries, such as retail, hospitality, and entertainment industries. The compliance requirements, such as EMV, in effect in the region for enhanced security of payments add to the growth of the North American wireless POS terminal market. Security issues related to wireless technology is a factor restraining the growth of the market. Some of the major players operating in the market are Ingenico (France), Verifone (US), First Data (US), PAX Global Technology (Hong Kong), NCR Corporation (US), Diebold Nixdorf (US), BBPOS (Hong Kong), Elavon (US), Castles Technology (Taiwan), Winpos (Finland), BITEL (Korea), Cegid Group (France), Squirrel Systems (Canada), Newland Payment Technology (China), and CITIXSYS AMERICAS (US). These players adopted various strategies such as product launches and developments, contracts, acquisitions, partnerships, and business expansions to cater to the needs of the market.